There’s an Easter Egg inside the chumby One (which is now on sale at Costco online for $99, cheaper than chumby.com’s $119 price!) that enables it to work with certain 3G USB modems and function as a 3G router (similar to a MiFi). 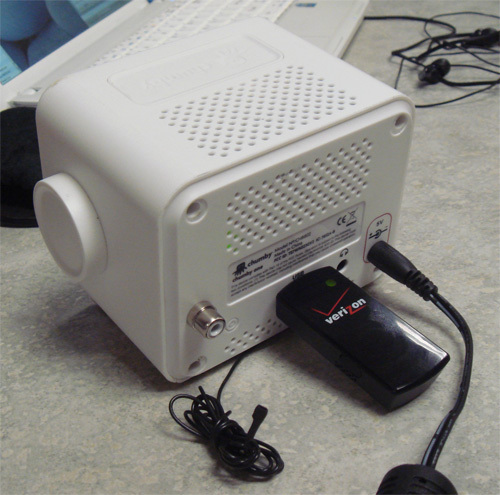 Above is a picture of a Verizon USB760 modem plugged into the USB port of a chumby One. 3. Select “create a new connection”, press OK, and wait for the scan to time out. 8. Tap “OK” to select None as the encryption type. 9. Tap “OK” to select Automatic IP allocation. To activate local wifi sharing, ssh into the device (or plug in a USB keyboard to activate the drop-down console) and use the command “touch /psp/start_ap” to flag the network setup scripts to configure your chumby One as an access point. Note that AP mode also works with other network sources, such as Ethernet-over-USB. This works because the chumby One ships with a copy of pppd, hostapd and a set of glue scripts (courtesy of xobs) that allow it first to talk to the 3G network, and second to work as an access point that shares the 3G connection with other wifi devices using its internal wifi card. Since this is an Easter Egg, it has a few rough edges on it, such as no native UI to do things like configure your AP SSID and encryption mode, and for many GSM networks you’ll need to enter a custom username, password and phone number; but you certainly can ssh in and tweak the scripts to set those things up. Regardless, this is a very handy trick that I’ve used in hotels from Shenzhen to Tokyo to New York to set up a wifi hotspot (complete with Internet radio and chumby apps) on the road — the hack works with quite a few 3G dongles and networks (given a little tweaking). This entry was posted on Thursday, April 29th, 2010 at 12:33 am and is filed under chumby, Hacking. You can follow any responses to this entry through the RSS 2.0 feed. Both comments and pings are currently closed. Nice – but another little tidbit interests me: what is that (what looks like a) cinch connection on the back of your Chumby One for? Is that a feature on an upcoming hardware revision? Can you please ban these useless linkbacks? The comments section has 1 real comment, your response- and 8 linkbacks. What’s the point? I’ll cast a vote for ditching the retarded linkbacks as well, please. There’s even more since the first comment about them. I don’t *usually* get this much redundant backlinking — typically the backlinks are more interesting, with insight added by another blogger who happens to reference this post, as opposed to a simple copy/paste on yet another blog. However, it seems there are some sites that bot content off of major tech blogs, and for some popular articles this causes a massive amount of redundant back-linking. Looks like WP has a feature where I can disable trackbacks on a per-post basis. I’ve turned off the feature for this post, so hopefully that resolves the concern. Could this work with a USB wifi antenna? Will this work on the older chumby model? Anyone knows if updated firmwares are being released for it?? would this work with a Clear 4g usb modem? will this work with the older chumby? I have to admit that your entire weblog is extremely informative. I have been spending a whole lot of spare time over the last couple months exploring at what exactly is around in accordance with the fact that I am preparing to launch a blog page. The knowledge you have place on here is literally to the point. It just sounds so mystifying in regards to all the programming languages that are available on the market, but I enjoy the way your appears to be. Gotta love where technological innovation has come over the past 15 yrs. Do you have to use a registered and activated Verizon USB760? I bought one from eBay and tried this procedure today and it didn’t work for me. I was thinking this would just allow me to connect locally and use my broadband for access and not having to involve Verizon at all. Is that correct? Can you give us some hints on how to change the wifi SSID from “ChumbyFW” to something else? 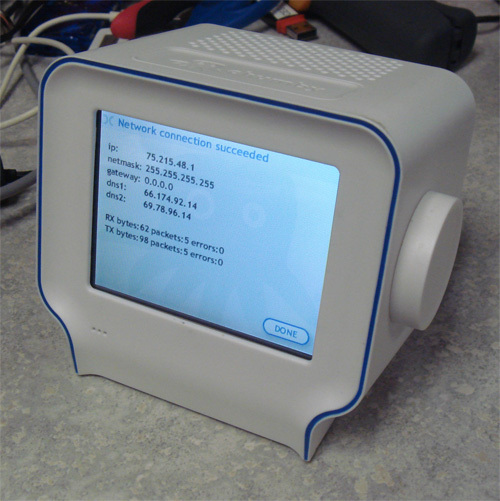 Or on how to enable WPA2 encryption for the network the chumby One creates? There is no doubt that the Christian louboutin is the best high heels in today’s fashion world. Back linking can be a worthwhile aspect as well as help out in off site SEO. Have you ever detected text links result in a reverse consequence on search engine rankings? And do you know if there is a means to reveal when pay per click is better than organic link building? I myself own various online businesses and as a matter of fact manage a backlink building service. Still, I sometimes see it useful to use Google Adwords compared to link building. That winter vacation, girls with boys contacted through the network, cheap handbags outlets they are junior high school students after a few days after contact with the boy in love with the familiar and unfamiliar the old school, then graduated from junior high school has more than four years of time, and four years they have never met, coach bagsbut also in junior high school, did not any of the intersection, the girl also accepted a very good impression of the boy she boys and girls are convinced that the feelings between them will be lasting, but everything seems not so simple, coach puresesgirl school professional certification exam on the busy, often sleepless nights in the “eating” books. What a great journal. I spend hours on the internet reading blogs, about tons of different subjects. I have to first of all give kudos to whoever created your theme and intermediate of all to you for writing what i can only describe as an astounding post. I honestly think there is a skill to writing articles that only very few posses and honestly you got it. The combination of educative and upper-class content is definitely extremely infrequent with the astronomic amount of blogs on the internet. Begin by finding an easy to get is that it connects better with. I found this very complicated. How can a novice make a router like this? I find it very easy to use internet on my mobile phone and I do not need a PC as my mobile phone has everything that i need! I’m going to give this a go with my Chumby… expect a reply from me very soon if I don’t get it to work!